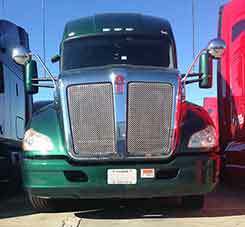 The truck and trailer pre-/post-trip inspections are some of the most important parts of a truck driver’s work day. This might seem like a hassle, especially during inclement weather, but it’s a lifesaving necessity. A thorough inspection is much better alternative to a preventable accident. In a previous blog, we covered the 3-Point Stance and how to safely move in and out of your truck. Now that you are safely on the ground, it’s time to start the inspection. During an inspection you will use 4 senses: sight, smell, hearing, and touch. The best way to start your inspection, before you even turn on the engine, is to look at your vehicle to make sure nothing is out of place. Remember, the most common injuries for a truck driver happen in or around the truck. On the left side of the steering wheel there is a Light Check switch. Flip this switch on before leaving your truck. This will cause all of your lights to blink, including the brake lights. If a trailer is hooked up to your truck, this switch will cause those lights to blink as well. Stand in front of your truck, then the side, then the back. Make sure the headlights and taillights are not cracked or broken. Verify each light is properly mounted and secure. If there is any issue with any of your lights, make a note of it on your pre-/post-trip inspection and continue with your inspection. Do not drive the truck if there is an issue with the lights. Stand in front of the truck. Be far enough away to see the ground underneath the engine. Is the truck leaning to one side? 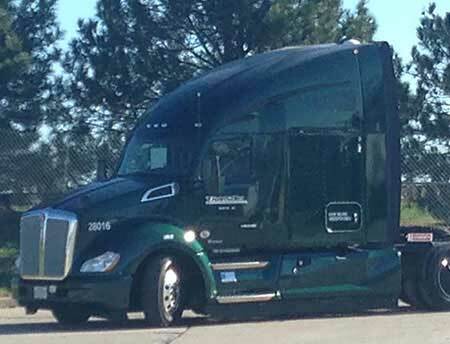 A leaning truck could mean anything from a deflated tire to a faulty suspension. If the trailer is attached to your truck, a lean could indicate an uneven load. Make a note of the lean on your pre-/post-trip inspection and continue with your inspection. Do not drive the truck if it is leaning. Look at the ground underneath your truck. Are there any puddles of liquid that were not there during your last inspection? Do you see anything dripping from your truck? Are there any weird smells, like fuel or antifreeze? Leaking fluids could mean several different things. Make a note of where and how much fluid is leaking from your truck on your pre-/post-trip inspection and continue with your inspection. Do not drive the truck when it is leaking fluids. Safety is important. After your pre-/post-trip inspection, if there is anything wrong with the truck, company drivers must do the following. Over the Road – Contact Road Assist. They will instruct you on what to do next. On the Yard – Contact the Shop. They will instruct you on what to do next. For independent contractors, you may also contact Road Assist and the Shop and they are happy to assist you with recommendations on how to resolve these issues. If repairs are needed, do not move the truck until the repairs are completed.